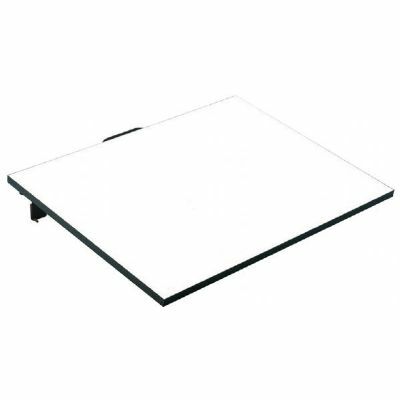 TILT-ANGLE WHITE DRAWING BOARD 20" x 26" Professional-quality portable drawing board for all kinds of creative uses. Perfect for students and those who need an accurate drawing surface but don't have the space for a full-size table. Smooth, white Melamine surface for bump-free drawing. Particle board substrate is 0.63" thick for strength and durability. 3" folding metal legs are set at an angle to prevent accidental collapse and include rubber-dipped ends to prevent scratching. Boards can be used in the elevated or flat position. 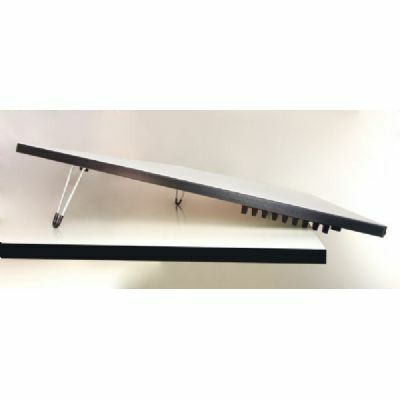 Rubber grip tracks underneath allow front of board to overhang a table edge up to 8". This increases the working angle and brings the drawing surface closer to the user. Drawing board is CARB compliant and all components are phthalate and lead-free. 20" x 26" board size.